‘Capitalism has ripped the heart out of education’s fundamental principles.’ Bradley Allsop discusses how the focus on employment above learning, the rise of ‘lad culture’ in universities, and stifling of creativity through curricula devoid of passion are all interlinked with the growing influence of market ideology into education. 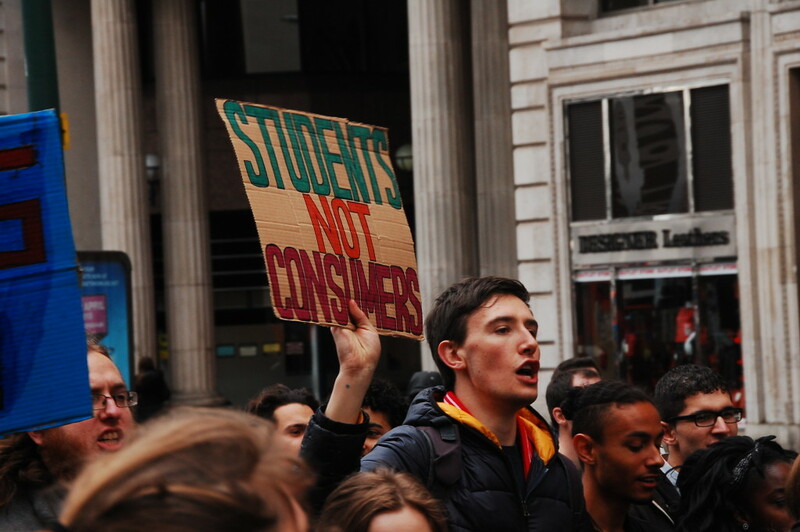 ‘Students not consumers!’ Students at a Free Education Demonstration in Birmingham in March. Photo: William Pinkney-Baird. Remember the story of the woman who swallowed a fly? This unfortunate lady ended up with quite the menagerie within her stomach because of her ever-escalating ‘solutions’ to her dietary dilemma. On both sides of the Atlantic the higher education sector has ingested a whole lot more than a simple fruit fly, and it’s efforts to rectify things look set to swallow up my generation’s wealth, time, and ultimately their future. Bizarrely this old wive’s tale is becoming a new generation’s nightmare. As a sector, there is now tens of millions of pounds spent on ‘marketing’ in UK higher education, a figure that rose by 22% in 2013 despite a 7% drop in applications due to fee rises. Marketing professor Chris Hackley claimed that such expenditure for large swathes of mid-level universities was likely to be ineffective, as for many students locality, variety of courses and grade requirements are the determining factor- something advertising can do little about. 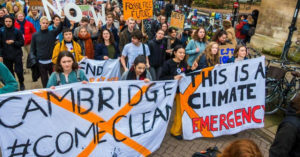 It is pointed out in the article that this is expenditure likely to only increase due to the ‘circular logic of the market’- if one university does it their competitors feel compelled to as well. The documentary ‘Ivory Tower’ explores how this circular logic has reached truly epic proportions in the US, with plasma TV’s, swimming pools and saunas being offered at many universities, with a constant search for bigger and better that serves only to push costs up. In many ways this is divorced from student interests and the founding principles of higher education, yet it is the student that will end up picking up the bill. I experienced this for myself when I recently attended a UCAS fair in London. Each university was squeezed into little boxes (with those with larger budgets being able to pay for extra space and fancier gizmos) piled high with prospectus’, usually standing in front of a TV screen with a student saying something vaguely inspiring on loop. The hall was one big procession of ‘one-up-manship’, universities competing against each other, no friendly academic spirit, just unabashed hostile competition. The little ‘careers’ section of the hall was populated by the likes of KPMG and Deloitte, ensuring that only the very best and least moral capitalist enablers were on show for young and impressionable students and this is the point. University is no longer about learning, it’s about employment. As Noam Chomsky once said: “If you burden students with large amounts of debt, they are unlikely to think about changing the world”. Most of the students I know quite readily admit that they came to university to ‘get a better job’, that they’re doing their degree because ‘it’ll pay well’, and that they’re going to their lectures because ‘they have to’. Very few people actually enjoy education anymore, and even less are thinking about how to change the world. Not only is the loss of academic passion beset by the employability agenda of successive neoliberal governments, it also suffers from a psychological onslaught best captured by the phrase ‘lad culture’. Increasingly universities seem to be little more than chauvinistic playgrounds rather than critical paradises. This is partly due to the profound ways in which paying for your own education distorts the relationship between lecturer and student: no longer is the student humbly learning and being challenged by their tutor, they are a customer, and the customer is always right. On some unconscious level the enormous debt we are saddled with seems to give us our entitlement to a good grade in the place of hard work and academic rigour. David Hartley foresaw this back in 1995 in his piece: ‘The McDonaldisation of Higher Education’, arguing that increasingly education would have a focus on “efficiency,” “calculability,” “predictability,” and “control”, and that in all probability teaching in classrooms would become a thing of the past. Why bother with lighting and heating a room and paying an hour’s wages to a lecturer when you can just put the slides up online for the student to peruse from the comfort of their own home? In many institutions now the priority is not on quality but quantity, with many online courses having dreadful pass rates but lovely profit margins. The problems are not just limited to higher education either, far from it. One anonymous blogger describes the painful experiences of their adopted children who have come through abuse and neglect to be met with an inflexible curriculum. They talk passionately about an educational system devoid of that very thing: passion. Where arbitrary lines are drawn between successes and failures, where a ‘one size fits all’ and ‘teach to the test’ approach stifles creativity and erodes self-esteem, and constant assessment of students and staff alike breeds stress and anxiety. This is no system that can help their vulnerable children, instead it only adds to their problems. The Green Party’s Martin Francis also highlights the disastrous attempts by Michael Gove to introduce elements of competition and market ideology into the schooling system. Not content with putting intolerable amounts of pressure on staff and enforcing rigid and restrictive criteria for success, Ofsted have been used as a tool for ushering in more academies under Gove’s reforms. As Francis puts it, Gove’s reforms have fragmented the sector, pitting school against school (much like the UCAS fair I attended) creating a ‘corporate’ rather than a public service identity for education. This fundamentally undermines the cooperative nature of education. Whether it be ever-escalating marketing wars, a customer mentality, or obsession with efficiency and employability, all have their roots in capitalist ideology, an ideology aggressively expanding into the education sector. The inevitable logic of ‘austerity’ as well, leading to cuts to students support and higher education funding and the tripling of tuition fees is the only real answer capitalism has to the deficit, an answer clearly not in the interests of students or anyone else without a Swiss bank account. Capitalism has not killed education in the obvious senses that its proponents attempt to highlight—more and more attend university each year. What it is slowly doing is a much more subtle and lamentable death—it has ripped the heart out of its fundamental principles. It is confining the imaginations and the aspirations of a generation. 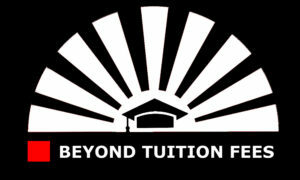 It is offering a bleak and debt-ridden future to millions. Education must respond to profound challenges, unimaginative governments and technological innovation, but it must be a response that is driven by its foundational principles. Every student and teacher must join the fight to ensure it is creativity, expression and critical thinking that is dominating our schools and universities, not efficiency or profit. If all stake holders are given a voice in education we have a real chance to craft something that is engaging and exciting, a system that makes children not want to leave the classroom, that challenges the status quo and transforms society. It is a fight that is coming to the Ivy League campus and the old polytechnic classroom alike, but though separated by space we are bonded by cause. Students are the life blood and the driving force of at any level of education. Occupations, collective effort and solidarity have worked in the past and can work again. As long as there is an engaged and determined student population within our various institutes of learning, there is no limit to what can be achieved- a denial of this is simply a lack of imagination. We are not educating our children, we are simply training them. At the end of their course they are trained physicists, doctors, mathematicians, etc. Education, in the sense of giving intellectual, moral & social instruction to students as a prolonged process as well as imparting all the necessary knowledege required for their subjects of choice is just not there. While agree with the gist of the first 4 or 5 paras I take serious issue with the last 3 or 4 paras. But our training at the universities is excellent. Considering the number of Nobel Prizes, and the intake of foreign students we should take pride in our ability to impart the most up to date knowledge in the best possible way. Any other countries, including those from the Far East, which are above us in the league tables are not educating their children any better. This is because capitalism is at present supreme – we have tried socialism and communism and none have worked. Our students don’t go to Cuba to study but the Chinese & Indian students come here to study.